Discovery bottles provide preschoolers with the opportunity to learn through hands-on, open-ended play. You can make distant concepts that might otherwise be out of their reach, like outer space, fit literally in their little hands. 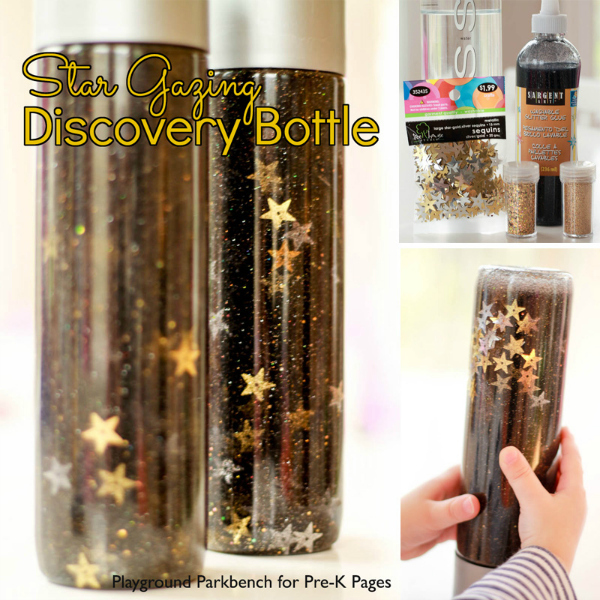 These Star Gazing Discovery Bottles let my toddler and preschooler explore stars, star formations, and inspired lots of awe as well. The stars have enamored children and grown-ups alike for centuries. Long before we understood the science of space, astrologers studied the stars. They looked at the skies and named formations after animals (The Great Bear), common day objects (The Dippers), mythological creatures (Pegasus), and the Greek gods and goddesses. 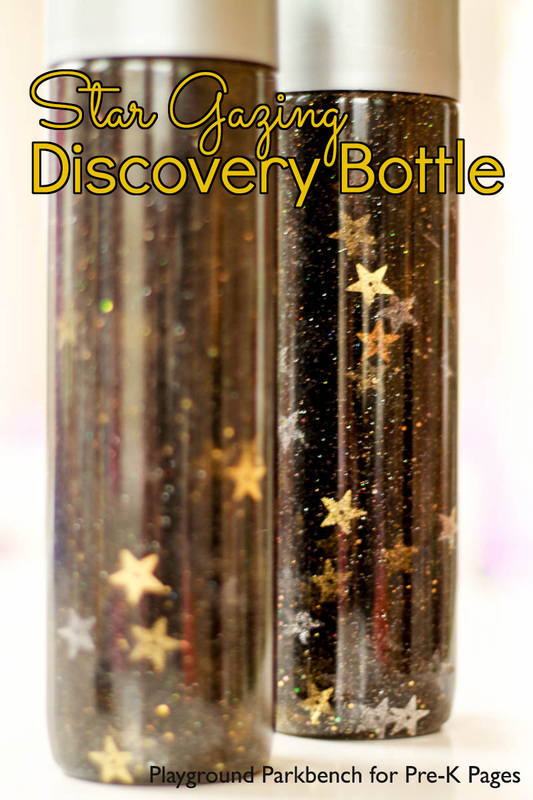 Since the stars come out after most preschoolers go to bed, you can create Star Gazing Discovery Bottles to let them study the stars during daylight hours! Like sensory bins, discovery bottles typically contain filler, as well as smaller pieces of components for study. In this case, our filler is watered-down black glitter glue, and our pieces of study are sequin stars! Remove the water and labels from the water bottle. 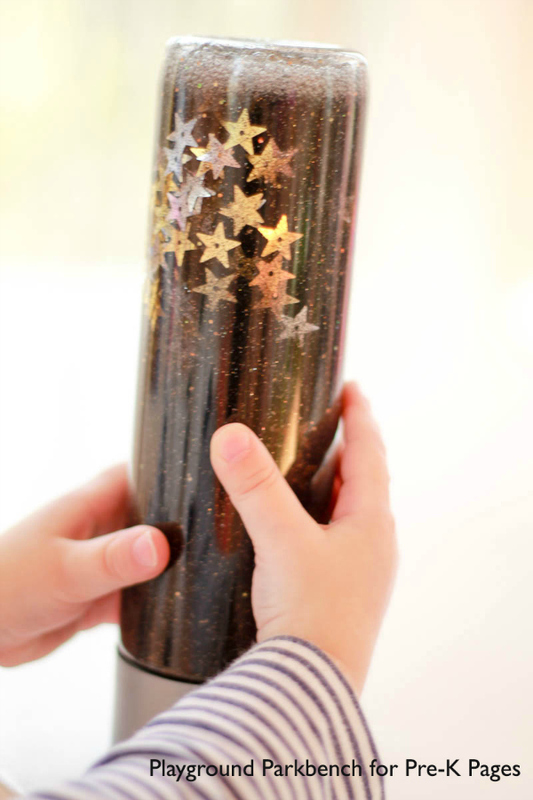 Combine warm water with the black glitter glue in a large measuring cup. Stir well. Fill the bottle 3/4 full with the glue mixture. 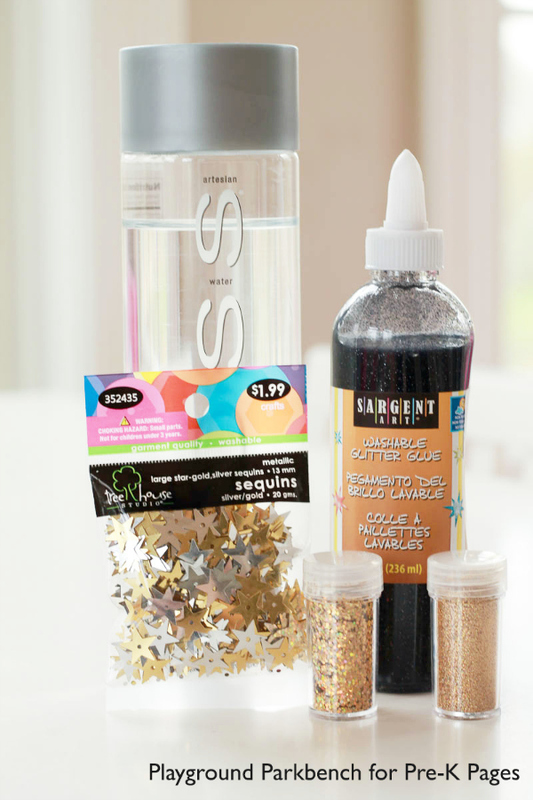 Add the a few sprinkles of star sequins to the bottle. For extra sparkle and texture, you can also add different weights of gold glitter. Close the bottle tightly, shake and observe. If you want your mixture to move more, open and top the bottle off with more water. To make it move even faster, add a few drops of clear hand soap. To make it move slower, you can top it off with additional clear glue. Once you are happy with your mixture, seal the top closed permanently with super glue. “Wow!” was the first word from both my preschooler and toddler when I handed over the bottles. I introduced them to the concept of constellations, or shapes formed by the stars, and told them they could shake and observe their star gazing bottles for shapes. I encouraged them to name different shapes they saw, whether as recognized constellations or just everyday shapes. Older preschoolers can even draw or journal about the formations they see in their discovery bottles. I have left them out on their craft table, and they have been at it for days now! BIO: Meghan is a former hedge fund professional turned SAHM to Big M (4), Lil’ M (2), and Baby M (7 months). She writes at Playground Parkbench, where she shares kids activities, parenting tips, and financial savvy for families. When she’s not busy changing diapers or scrubbing glue off the craft table, you can find her on Facebook, Instagram, Pinterest, and Twitter! Follow my Outer Space Pinterest Board for more great ideas!